Have you ever looked at a pedigree and wondered what some of the cats behind your kitten looked like? Wondered where your cat's wonderful eyes came from?... Wondered what cats you should be line-breeding on? PandEcats.com is devoted to providing a photographic history of cats for today's breeders... and the breeders of the future. What we hope to build is an alphabetical galley of photos of Persian and Exotic cats so that years from now, fanciers will be able to see the cats that have gone before. 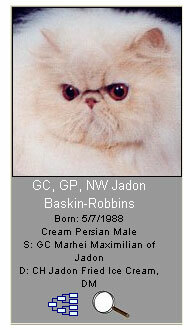 Each cat in the Gallery features a photo, the cat's name and titles, birth date, sire and dam. If you see a small pedigree icon underneath the cat's information, you can click on it to see the cat's pedigree. If you see a small magnifying glass, click on it to see a larger photo of the cat. Every new member of PandEcats receives a free submission of a cat to the Gallery. Each year when you renew your membership, you receive another free submission to the Gallery. Additional submissions are only $5/cat or 3 cats for $10.